Mid-century meets minimalism. A perfect match with our Annaliese Sofa, this accent chair sits elegantly around your coffee table or living room corner. 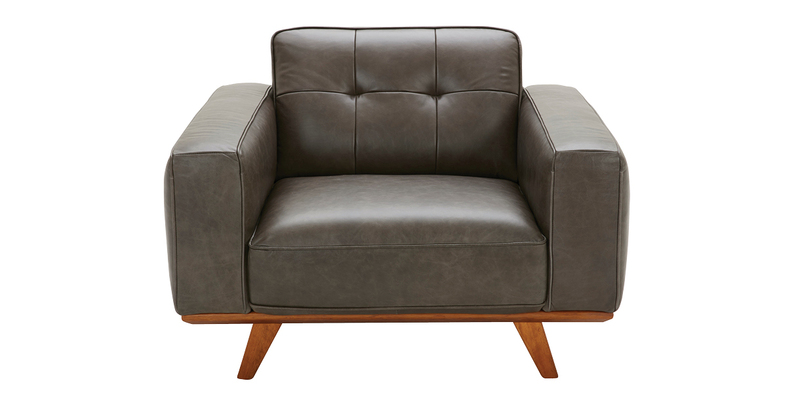 Smooth vintage leather in gray or blue fabric wraps around a beautiful low-profile design with a slanted backrest that’s fully tufted. Cushioned seat sits on a sleek wooden slab and angled legs that breathe a mid-century flair. Long, squared arms provide support for lounging in comfort while watching your favorite TV series. Upgrade your space with this sophisticated piece.